Anyone familiar with the dynamic posters and typography conceived over decades by Philippe Apeloig might be surprised to discover that his designs for La Manufacture de Sèvres are absent of lettering. Instead, he’s used the slashes and punctuation marks that frequently feature in the composition of his typefaces to produce three rhythmic motifs that speak to the fluidity of his work. Unlike the prescribed right-side up format of a page or sign, the porcelain maker’s classic ‘Diane’ service plates encouraged Apeloig to consider how the circular shape would dictate the placement of his patterns. In this way, ‘Tourbillon’ consists of gold slashes that diffuse outward and curve like a cresting wave; the pointillist array that glows from the Sèvres blue surface of ‘Galaxie’ demonstrates how grammatical dots can be arranged as cosmic scenery; while elongated hyphens that make up ‘Paille’ (straw) appear as a fine sprinkle of sprigs. The invitation was extended to Apeloig by Romane Sarfati, general director of the Cité de la céramique Sèvres et Limoges after she saw his drawings and watercolours in a show at the Galerie de Multiples in Paris last spring. Yves Mirande, the manufacturer’s director of culture and communication, suggests that she recognised ‘the balance’ inherent to Apeloig’s work, noting that he is the first graphic designer to contribute a series. Apeloig, who devised a scarf for Hermès in 2014 by using the page layout of Roland Barthes’ Fragments d’un discours amoureux (A Lover’s Discourse: Fragments) to arrive at a genius geometrical pattern, is no stranger to abstracting and reimagining references both ordinary and esoteric. 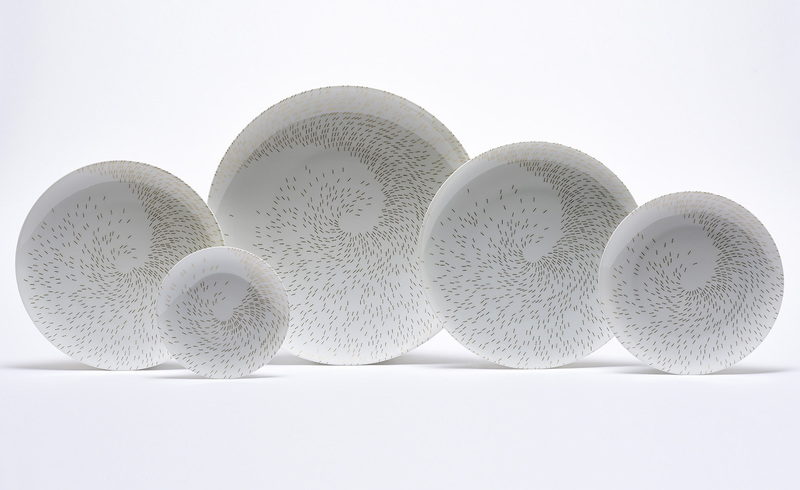 With the plates, a nod to Japanese artist Hokusai comes through – not just in the wave but also in the broader arrangement of the minimalist patterns. However, his talent for coaxing such beauty from prosaic punctuation is what makes these works unique. Worth noting, too, are the precise production aspects: for ‘Tourbillon’, the result of photosensitive printing, the gold slashes continue around the downward edge of the plates; whereas ‘Galaxie’ and ‘Paille’ were engraved to enhance the depth of the gold detailing. High-gloss and slightly concave in all five sizes, the plates ultimately absorb Apeloig’s serene markings into their self-contained volumes. This does not preclude them from being used, especially when the food is up to a similar standard. He notes how he intentionally avoided concentrating the pattern activity at the centre, for instance. ‘The plates play with emptiness – they’re not over-designed,’ he says. Even if the focus becomes a stack of asparagus stalks, his effort would not go unnoticed. ‘It’s a real motivation to reinvent yourself. I’m not bringing recipes,’ he says, gliding over the double entendre. His reproduced signature – his truest typography of all – happens to be on the reverse side, adding to the Sèvres branding. But of course, it’s poor form to look.